Penrhos College principal Glenda Parkin first realised something was not quite right in July 2008 while in Wales with girls who were to sing at an eisteddfod. She put it down to tiredness but later realised she was taking longer on simple tasks and found it increasingly difficult to listen and write notes at the same time. At an education conference, she found herself anxious that people sitting near her would notice that she was not spelling everything correctly. She took six months leave in July for a battery of tests and brain scans to try to find out what was wrong. At just 56, Dr Parkin retired officially last month after she was diagnosed with early onset Benson’s syndrome, or posterior cortical atrophy, a rare visual variant of Alzheimer’s disease which is gradually robbing her of her ability to read, spell and recognise familiar objects. There is no known cause, therapy or cure and death usually follows in eight to 12 years. As well as leading Penrhos College since 2008, Dr Parkin was head of WA’s biggest private school, St Stephen’s in Duncraig and Carramar, for six years. 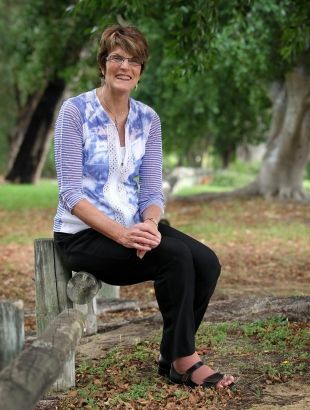 The diagnosis was devastating for someone who has excelled academically all her life – winning a scholarship to university, getting an honours degree in geography and a PhD in curriculum development, writing social studies textbooks and lecturing at Perth’s five universities. Now the hectic round of school farewells is over, Dr Parkin is slowly coming to terms with the way her life has changed. “I can’t do money any more,” she said. “I go to the shops and they say ‘that’s $10.25’ and I think ‘oh my gosh, what does that look like? '” She hands over a big note and hopes for the best. Driving is out of the question. “It takes me ages to type something. I can’t find the keys, I can’t remember how to spell. It’s incredibly frustrating,” Dr Parkin said. On the upside, she now has more time to exercise and people tell her she looks better than she has in a long time. Dr Parkin agreed to speak to The West Australian to help break down the stigma and ignorance associated with dementia-related disease. “You do not know what’s going to hit you any day and when you look at the number of people now who have some type of dementia, it’s huge and it’s going to be a crisis for Australia,” she said. Two things have helped her enormously – her faith in God and the support of friends and family, including her husband and two sons, aged 17 and 20. Her message for anyone who knows someone with Alzheimer’s is to make the time to visit, even if it is for just five minutes. “It really just helps you so much, that someone cares enough to come and say ‘hi, how are you going’,” she said. She finds solace in church. When everything threatens to overwhelm her, she walks furiously to the highest vantage point near her northern suburbs home where she can see the ocean, city and hills to have a “big conversation with God”. In darker moments she worries about how her condition will affect her husband Bronte when he can no longer care for her. Despite her strong religious beliefs, Dr Parkin said she would rather not continue living if she reached a stage where she was just lying in a bed being fed. “Once I get to a point where all I’m doing is using resources and not really contributing … to me, that’s not really life,” she said. Her neurologist told her that if there was a place in the world she particularly wanted to see before her vision deteriorated, she should visit before the end of this year, “which is a bit scary”. She is planning a canal barge trip in the south of France. She hopes she has made some difference to all the students’ lives she has touched.